The Statue of Unity is an under construction monument dedicated to Indian independence movement leader Vallabhbhai Patel located in the Indian state of Gujarat. 182 metres in height, it is to be located facing the Narmada Dam, 3.2 km away on the river island called Sadhu Bet near Vadodara in Gujarat. This statue is planned to be spread over 20,000 square meters of project area and will be surrounded by an artificial lake spread across 12 km of area. It would be the world's tallest statue when completed. 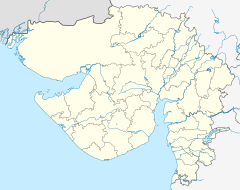 Sardar Vallabhbhai Patel Rashtriya Ekta Trust , a special purpose vehicle was established by the Gujarat government and the outreach programme across India was carried out starting December 2013. The Statue of Unity is an under construction monument dedicated to Indian independence movement leader Vallabhbhai Patel located in the Indian state of Gujarat. 182 metres (597 feet) in height, it is to be located facing the Narmada Dam, 3.2 km away on the river island called Sadhu Bet near Vadodara in Gujarat. This statue is planned to be spread over 20,000 square meters of project area and will be surrounded by an artificial lake spread across 12 km of area. It would be the world's tallest statue when completed. Sardar Vallabhbhai Patel Rashtriya Ekta Trust (SVPRET), a special purpose vehicle was established by the Gujarat government and the outreach programme across India was carried out starting December 2013. Initially the total cost of the project was estimated to be about ₹2,063 crore (US$310 million) by the government. Later Larsen & Toubro won the contract in October 2014 for its lowest bid of ₹2,989 crore (US$440 million) for the design, construction and maintenance. The construction was started on 31 October 2014. A video on the upcoming #StatueofUnity. The statue will be a tribute to one of India's foremost statesmen and leaders #SardarVallabhbhaiPatel. This is Part 2 i have covered Statue of Unity, till the observation deck. I have mentioned all the things you should do and not do if you plan to visit this place.